"There are no better drums than Yamaha. Whether it's on a gig with my Stage Custom Birch or in the studio with my Recording Custom, these drums constantly deliver in tone, quality and look. No matter what style I'm playing, my Yamaha's are versatile yet consistent. Yamaha drums are my sound!" Darran Muller is a professional Musician, Producer, Music Director and Teacher with over 20 years' experience in the music industry. He began playing drums at the age of 6. At age 10 he was performing regularly in public and at 13, was hired for his first recording session. It was also at the age of 13 that Darran began teaching drums. Darran has built his reputation on his ability to adapt his style to many different musical situations coupled with his intuitive approach to performance. Darran has developed into a highly respected and sought after musician and music director for live and studio work. Darran has played on more than 400 Recording Session for commercially released albums, TV jingles, Short Film Soundtracks and Theatre Productions. Darran is also a sought after producer with over 40 album projects to his credit. He has toured internationally and nationally playing drums with artists such as The Ten Tenors, Evermore, James Morrison, Emma Pask, Darren Percival, Grace Knight, The Seven Sopranos, Planet Shakers and Grammy winner, Henry Seely. Darran also plays with his own band "Deluxe" and is also in demand as a freelance drummer / percussionist. Darran has over 20 years teaching experience and has performed many workshops and clinics in Australia and Overseas. 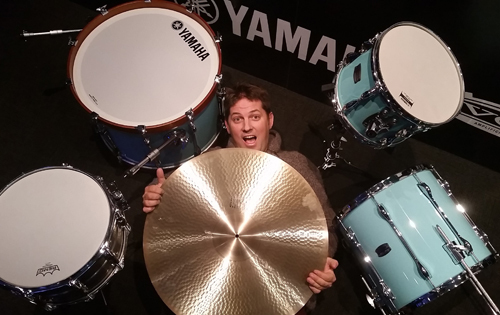 He is a proud endorser of Yamaha drums and Paiste cymbals and currently teaches drums at JMC Academy, Brisbane. Recorded and engineered drums on Ash Gale’s track "Sweet Release"